First, Nestlé announced its plans to quit. Now CIPFA, the Chartered Institute of Public Finance & Accountancy, has completed the task of moving staff to its London HQ, and away from the old NLA Tower. Who might be next to desert the concrete canyons of Croydon? Nestlé and CIPFA are just the latest signs of the need to put together a practical menu of options to recover the town’s fortunes. Croydon Council is not providing that menu. In announcing it was to leave its home of nearly half a century, Nestlé said of its new location – on an industrial estate under the flightpath of an international airport – that “it will provide a modern, efficient and attractive workplace for our people, in an ideal location”. It is a very significant criticism of Croydon Council that despite Nestlé giving Croydon five years’ grace to find them a suitable building, nothing happened. Croydon once had civic leaders with the vision to commercialise the town centre in the 1960s, replete with subsidised arts and national quality concerts at Fairfield. The recent barbaric destruction of arts provision must have played some role in making Croydon less attractive as a national HQ for Nestlé – playing down to Croydon’s image as a cultural desert. Thank goodness the Warehouse Theatre goes on, despite occasional efforts in the last 25 years by the council to try to kill it. Nowhere in Croydon, though, could “modern, efficient and attractive” offices be found for Nestlé – and that is an indictment. 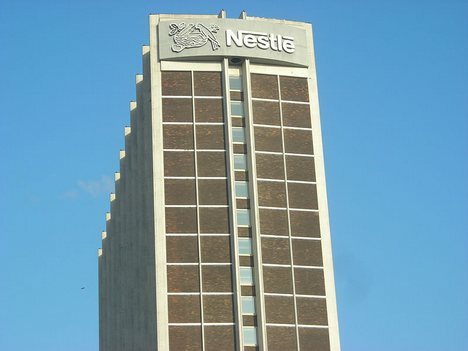 Croydon Central’s MP, Gavin Barwell, has claimed that when he was on the council, he offered to use Council Tax-payers’ money to buy the outdated Nestlé Tower in an effort to keep the mutli-national’s UK HQ in the borough. Heaven knows how this was supposed to be a solution. All that would have led to is yet more misguided property speculation on the rates by Croydon’s Chief Executive, Jon Rouse, who fancies himself as a wheeler dealer. Sadly, he has been well and truly outsmarted by the City boys. The vision these days is lacking. No that’s wrong. If anything, there has been a superfluity of glossy official “visions” for Croydon. There has been so much vision overload that local people don’t take them seriously any longer. 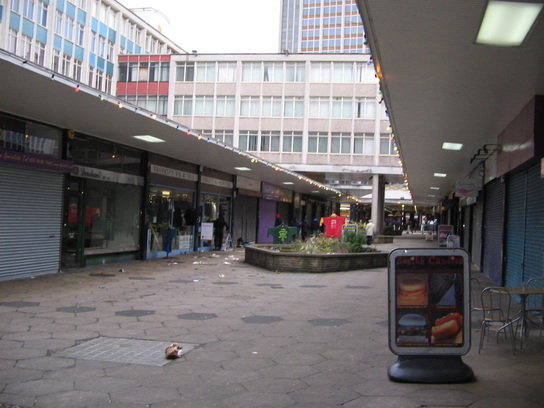 There is only one outcome for Croydon: blurred visions. These “visions” are all just the conglomeration of different developers’ plans. Developers are important, but they are here today and gone tomorrow, quickly moving on to the next big “project”, the next lucrative contract. As Simon Hall, Labour’s local re-development spokesman, has said, Croydon’s true partners are the businesses that are here to stay, and of course the local people who live, work and shop here. Is Croydon Council equipped to find any company capable of replacing Nestle? It is these businesses that will drive the demand that ultimately helps to fill developers’ speculative builds. Build from the ground upwards on these safe foundations. The Conservative-led government has already axed £65 million of funding for such work with business in Croydon. Another reason perhaps why Croydon lost out to a Crawley industrial estate for Nestlé’s future investment. Another reason Croydon has lost out is because of an obsession of the council – both Labour and Conservative – with building an Arena next to East Croydon station, a project that did not stack up financially, and which prevented Stanhope, the blue-chip owner of the land, from getting on with developing that site with a prestige tenant. It was an amazing feat for Croydon Council to miss the opportunity to redevelop the town centre during longest period of economic growth in our country’s history. A John Lewis store might have been delivered for the town at the site next to Nestlé’s offices if the company had seen high quality Stanhope work underway. 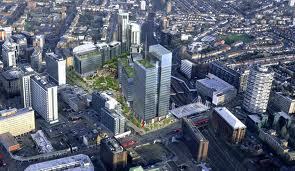 Stanhope built the spectacularly re-generative development at Broadgate. Certainly, redevelopment of the St George’s Walk site would have given Nestlé reason to remain. But Croydon only ended up losing loyal, much-loved and long-time partners of Croydon such as Turtles. And in its place, we now have… ? Meanwhile, Nestlé found themselves ensconced on top of a mainly empty shopping parade fit only for use in 1960s-period film pieces like Made in Dagenham. Croydon politicians do speak positively about investments to come to the town in the future. But they have been doing that since “Croydon: The Future” – another of those “visions” – in the early 1990s. It spoke volumes for Croydon that the exhibition hall was blown away by the winds – a bad omen for the borough’s prospects. While the Conservatives were delivering a new library and arts centre (now closed by nihilistic modern Tories, who have little in common with those earlier municipalist Conservatives), they realised that they had been complacent about Croydon’s business prospects. They were too late to find a new “vision” before their electoral demise in 1994. Westfield dreams – or another planning nightmare? It is little wonder that most ordinary people react with scepticism when local politicians, whether in the Town Hall or based at Westminster, start claiming the credit for the next big development to hit the town, when not a brick has been laid, nor a tile cemented on the site. In the latest instance, not a drop of ink has been put to any building contracts, either, as yet again the people of Croydon have been asked to believe that a wave of money is about to reach the town. Before Christmas, using social media, Barwell rather rashly took the credit for delivering a new investment in the Whitgift Centre from Westfield, the Australian shopping mall developers who opened their latest London centre next to the Olympic Park at Stratford last year. In Croydon, the reality is that the Whitgift Foundation has irritated the hell out of its partners by entering into a secret, exclusive understanding with Westfield. It seems all too familiar, the same old corporate fight that plagued the East Croydon “Gateway” site. Once again, politicians have managed to set two corporate teams at loggerheads with each other, creating a stalemate that will slow, if not scupper, redevelopment. Does Croydon need another part-completed or part-empty tower block? The council will point to the massive tower blocks that have been given planning permission in the town centre and in Addiscombe as proof of impending prosperity. Only this week, the council rubber-stamped a plan for a second 55-storey tower, this time on Lansdowne Road. But will this ever be built, and even if it is, will anyone want to live in it? Altitude 25, next to the Croydon Park Hotel close to East Croydon station, was supposed to be the first such impressive result of building a “landmark” tower to provide modern homes for high income young professionals. No one thought, when the planners had their “vision” for Altitude 25, that the “25” would stand for the occupancy percentage of the three-quarters empty building three years after it was completed. Then there’s the Sarajevo look of the almost abandoned IYLO development at West Croydon which ought to be a warning. Started in 2007, this tower is still not finished, not because of any architectural shortcomings or difficulties, but because of the financial collapse of a series of owners. Altitude 25 and IYLO, surely, demonstrate that whatever the developers and property speculators may claim when flattering Croydon’s planning committee, there is simply not the demand for these kind of “landmark” residential properties. 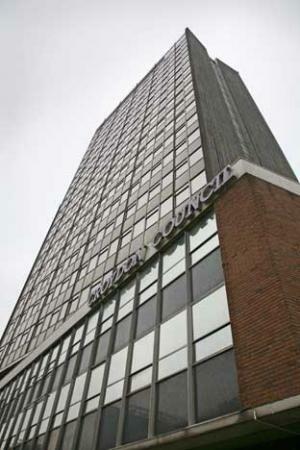 Will the 55-storey “Mental” Tower at East Croydon ever be built to overshadow Addiscombe? Even Barwell – who spoke against this project – has expressed his doubts about whether the developers intend to progress their scheme, or simply to cash-in from selling on the site, with its valuable planning permission. Nestlé were looking to move from their monument to the brutalism of the 1960s, and into an office building on a more human scale. Perhaps they also sought a council with a softer tone. The harsh, brusque and bruising manner of Croydon Council’s top management does not make for an attractive reason to stay in town. There are other reasons to leave of course. The M25 acts as a magnet for businesses to migrate away from congested Croydon. That’s a long-term trend. The riots may well have been the last straw for some businesses. The police only putting out a maximum of 100 of its 700 officers for the riots cannot give confidence to employers in Croydon. The release, under the 30-year government documents rules, of papers from 1981 that showed that Margaret Thatcher’s Cabinet seriously considered a recommendation to abandon Liverpool to a policy of “managed decline”, caused outrage and uproar. Yet it seems that our 21st century politicians, at the Town Hall, at City Hall by Tower Bridge and at Westminster, are now actioning a process of “managed decline” for Croydon. Conservative councillors represent an electorate largely from the south of the borough, where many people prefer to shop to the south rather than in central Croydon. Croydon, but in keeping the south of Croydon free of overdevelopment. Hence the Quixotic desire to see housing needs met by impractical tower blocks in central Croydon, not in what they would describe as “backland development” or “garden grabbing”. You can’t blame them for that. They are representing the will of the people. In many ways, perhaps this week’s launch of a Croydon Sadvertiser “South” edition is a reflection of how the two parts of the Borough of Croydon have grown so far apart that they are two very different towns. The voters in Kenley, Purley and Coulsdon respect value for money. But it is not clear whether the Conservative Council can really claim that they deliver “VFM”. It is an obscene act of hubris that sees Croydon Council building themselves a luxury headquarters as part of a £450 million development scheme while the economy of the town falls apart around them. The loss of 1,000 jobs at Nestlé’s Croydon HQ is both an horrendous blow for Croydon and the proof that building a new Town Hall is not the regenerative catalyst for Croydon as the council has tried to claim. It is a further scandal that the council, our council, refuses to be transparent about the details of its property speculation on the rates which it has embarked upon with a City private equity company, risking millions of pounds of Council Tax-payers’ money. Rouse, the council’s Chief Executive, has overreached himself in thinking that he can make a profit out of property dealing in a failing economy. The Croydon Council Tax money spent providing soft loans to the council’s commercial partner would be better spent on supporting local Croydon businesses. But for many local businesses, it may already be too late. and Barwell actually delivering on his promise to reverse the cuts in public sector jobs in Croydon by doing more than just having a meeting with Francis Maude. There is one further strategy which might help revive central Croydon and revise the broader public perception of Croydon, but when Croydon College applied for planning permission for a residential block for students – on a much more modest, more human scale that the Mental Tower – this was rejected by the Conservative-controlled council. Now, the council still has the opportunity to make Croydon College a residential university, with student flats in the empty Nestlé Building, with the effect of turning central Croydon into a youthful, vibrant part of the borough. It would also bring into central Croydon up to a thousand new voters, few of whom, however, would be well disposed toward voting Conservative, thus changing the make-up of that already marginal parliamentary constituency and several nearby wards completely. And that, of course, was never a consideration at all when the council previously decided to turn down Croydon College’s planning application. This entry was posted in Addiscombe West, Andrew Pelling, Art, Boris Johnson, Business, Centrale, Coulsdon, Croydon 8/8, Croydon Central, Croydon College, Croydon Council, Croydon South, David Lean Cinema Campaign, Gavin Barwell, Housing, Jon Rouse, Ken Livingstone, Kenley, Mayor of London, Menta Tower, Planning, Property, Purley, Ruskin Square, Simon Hall, URV, Whitgift Foundation and tagged Andrew Pelling, Conservative, Croydon, Croydon Council, Gavin Barwell, London, London Borough of Croydon, Nestle. Bookmark the permalink. A very good article by someone who knows more than most about planning in Croydon in recent decades. I agree with almost all of it. However I think Andrew’s vision of past generations of Tory leaders in Croydon is perhaps a little rose-tinted! The Council leaders in the 60s built a concrete jungle. One of their legacies is Wellesley Road,a canyon of ugly office blocks dividing the centre of the town from its main railway station. They destroyed large parts of Old Town with their road building and would have wreaked more damage if the Labour GLC had not halted the “ring road” scheme which Croydon Council devised. It is true that the old-style Tories built the Fairfield Halls but they also destroyed the town’s central swimming baths (then in Scarbrook Road) and resisted numerous campaigns to have it rebuilt. Incidentally a new publicly owned leisure centre and pool in the town centre would form a very welcome part of future plans for central Croydon – and might help the town to attract and retain businesses such as Nestle. Despite being broadly against the forces of nimbyism and in favour of the relaxation of planning laws in many cases (I don’t really understand the British hatred of tall buildings, for example), this is an excellent article which sums up many of my burgeoning frustrations about Croydon. The point about the self-congratulatory back slapping over proposed developments which will never get built is one dawning on me quickly as I get used to Croydon life. Once I’ve been here a bit longer I’m sure I’ll feel like I’m losing the plot with some of the council’s actions. When you look up which dullards have been running the planning agenda in Croydon, both elected members and paid officials, it’s easy to see why things are so crap now. Altitude 25 is just a dull grey monolith – not a landmark so much as a missed opportunity for one. It complements its half-built (never to be completed?) west Croydon counterpart, the IYLO tower – both represent a triumph of greed and naivety over beauty and realism. Promoting the expansion of Gatwick in an effort to boost jobs there for the people of Croydon; apart from the local and global environmental damage this would inflict, the idea that an airport 20 miles away will benefit the Croydon labour market is a little fanciful. Some of the people who queue up at the Jobcentre in Dingwall Road (and I have been one) find the journey there from their beds difficult enough, let alone travelling outside the borough to secure employment. Reducing parking fees to bring in visitors; to put it another way, increasing traffic, gridlock and pollution – and visiting what, exactly? The clone town that is our high street? The cultural delights on offer at the Fairfield Halls? The zero-scores-on-the-doors restaurants? The council should stop poncing about like Basque separatists without the bombs, pretending that Croydon is an edge-city in all but name that the Parisians will want to mimic, and abandon the failed paradigm that bringing in hoardes of motor vehicles along urban motorways will make us all richer. We need a localist urbanist agenda that recognises we are an outer London borough, and we need it now. One of the biggest problems with Croydon is that if you live in Croydon you generally can’t afford to work in Croydon. Unless you’re happy living in a match-box in a shared house in West Croydon somewhere. This creates a huge problem for filling these new flats. As the Locals just can’t afford the London Rate rents being charged. Hence why Altitude 25 is so empty, and the Mental Tower is also in for a shock. Why would people move to Croydon then? People on better wages, commuters, who can afford to pay the ridiculously high rents around here. We’ve just had The Riots, our Local Job-scene is nothing impressive ( low wages, and less jobs with employers leaving ), and some of our kids are gang-like and cause problems in our City Centre. It’s not useful is it? I see the wage situation locally as the biggest problem. We’re supposed to get half London Weighting in Croydon. And agencies and employers reliably claim it is factored into wages. And yet our wages offered are still lower than surrounding areas like Lewisham. The Temp Rate for an AA in Croydon Home Office is Minimum Wage for example. Where’s the London Weighting in that. It’s obvious why the Locals can’t afford to take up these new flats. Local wages just aren’t high enough. The second biggest problem is the Business Rates. According to @gavinbarwellmp some of the £23 million Borismoney will be used to lower Business Rates. To try and regenerate Croydon a bit more. This shows how much we needed the Enterprise Zone, but also shows The Council is growing to understand how The Business Rates around here are also too high. So Croydons’ challenges are: Business Rates are too high, Wages paid are too low, and Local Rents are too high. Those are not small challenges. Starting a business is too hard. As is getting a roof over your head. And if you get a job locally expect to struggle as well. Croydon is nothing but struggling. There’s no good life. And, obviously, that isn’t really very attractive to anyone. Why would people come here if life is so hard? There is a possible positive for the future though. With Altitude 25 75% empty, and The Mental Tower coming as well, it’s possible we’ll be left with a flat/ home surplus. And as the developers/ owners get more desperate they may well turn to housing The Disabled as an option. It may be income based on Benefits, but at least it is income. Rather than empty homes. And The Disabled are much less likely to smash the place up. I guess we’ll have to see what happens. Odd that. My husband and I have lived in Selsdon since 1989. He worked near East Croydon for years and years and year and we certainly COULD afford to live here. We have always had money for holidays abroad, meals out, etc. So I would never agree that people who work in Croydon can’t afford to live here. I have a neighbour who works at Nestles – he says the staff do not want to move, as there is nothing to do in Crawley near the industrial estate. Here they can go out to lunch, visit the shops, etc. He thinks it will end up with staff no longer having a lunch break, as there will be nowhere for them to go. The only thing I’d say Anne is that there aren’t enough jobs in Croydon which provide a competitive salary. The salaries on offer in the borough are generally considerably lower than London. While there are some jobs in Croydon which pay enough to support a good living standard while residing in the borough (e.g. working for the council? ), if a sudden influx of people were to actually materialise, ready to inhabit Altitude 25 and the like, not many of them would find work in Croydon. They would need to be earning a London wage to buy the apartments being built in these luxury developments. And as pointed out above, Croydon is suffering from a lack of appeal currently, which will prevent it from attracting these affluent people who work in London and view this borough as a run-down wasteland riddled with crime (an inaccurate image perhaps but one most young people who move to London seem to hold in my experience). Fascinating: I would like to offer a thought. I am not advocating any policy, just trying to set off a discussion. If the Conservative councillors are predominantly from the south of the borough, and this implies that the borough has divided into (at least) two, should the amalgamations of 1965 ever have taken place? Do they perhaps imply a natural division, artificially abolished. Michael Robbins in his “Middlesex” (1953) argued that the county of Middlesex deserved to survive: it had been linked to London for centuries, he said, “but it is not London”. He went on to say that the most suitable size for a local council was that of Friern Barnet, one of the smallest Middlesex districts. But what happened? The old boroughs and urban districts, right across the metropolis, were formed into boroughs even larger than the largest boroughs existing at the time Robbins wrote. I can also remember hearing someone from Sutton complain that Ken Livingstone largely ignored the outer areas. When I later buttonholed this person and asked “with hindsight should Sutton have remained in Surrey?”, he laughed but then said more seriously that the most southerly parts of that borough probably should. Well Croydon is next door: does the same apply? Incidentally I remember the local papers of Richmond thirty years or so ago using the word Croydonisation, meaning the construction of office blocks, to suggest something Richmond should avoid. I would be grateful for a little guidance here: if “Croydon once had civic leaders with the vision to commercialise the town centre” in what sense was it not commercial before that?